In my earlier posts, I have mentioned that Patek Philippe Nautilus is one of the best-selling replica watches online. There are basically three factories manufacturing this replica watch, BP, MK and PF. 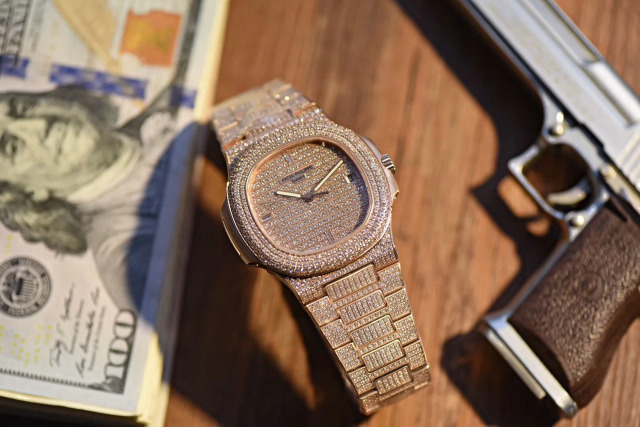 The Patek Philippe Nautilus replica made by BP has the cheapest price, MK made the best one in the past, while now the best one is made by PF factory. Nautilus 5711 is really popular in our market, MK version was very hot in the past and most of times it is out of stock. Now, the Nautilus 5711 replica made by PF is always available. I have posted a review about a BP Patek Philippe Nautilus watch with blue dial on this blog, you can read to get a basic understanding of Nautilus 5711 before reading this review. The two models I am going to introduce have one big feature, that is both are fully decorated with diamonds. One in stainless steel, the other is rose gold. 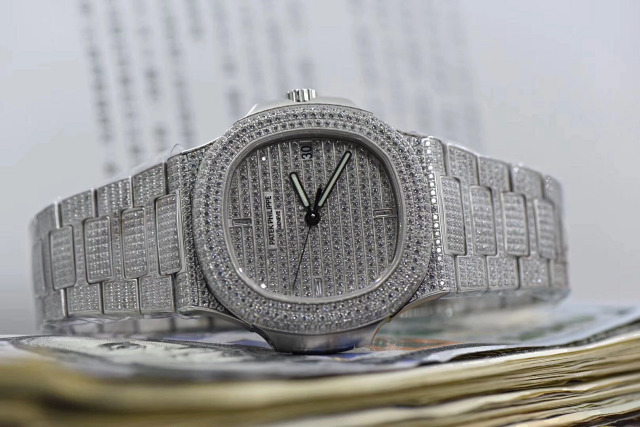 Actually I do not like watches decorated with diamonds, especially the one like this, with full diamonds on case, bezel and bracelet. 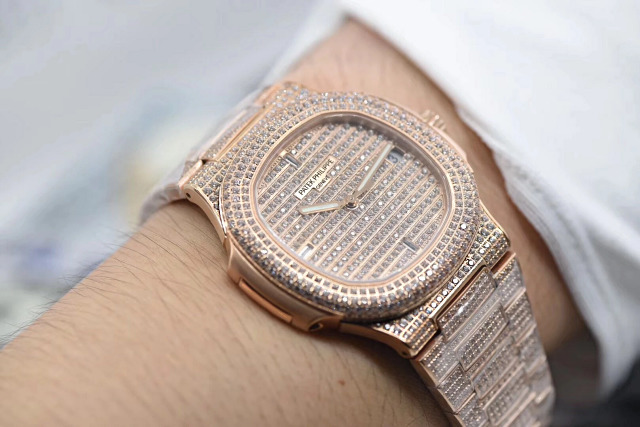 I think the whole beauty of the watch will be broken if some diamonds drop off, besides, I always think these diamond watches look too shiny on your wrist. 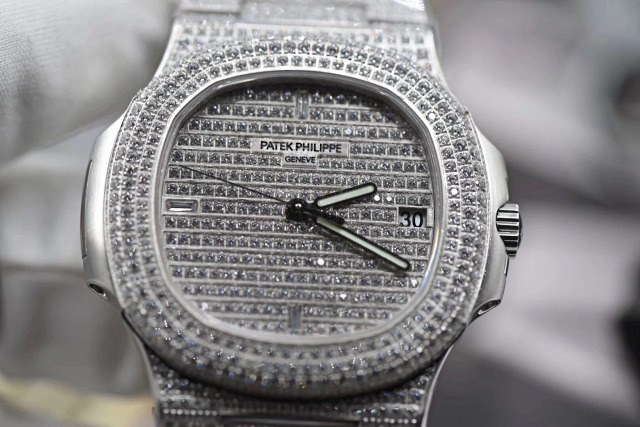 However, some people love such type of diamond watches. 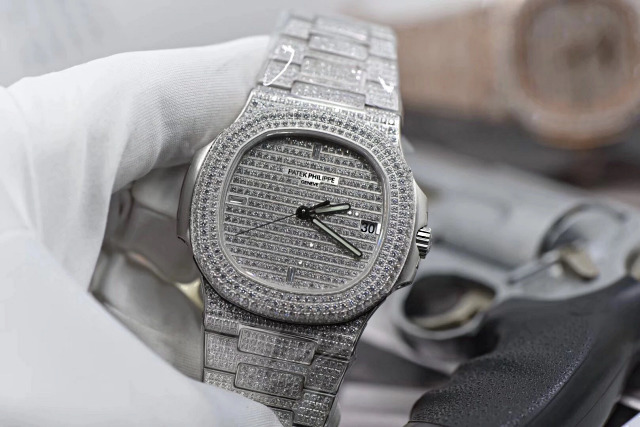 Fortunately, each piece of diamonds is set by factory watch master. Compared with the two models, I like the rose gold one more. 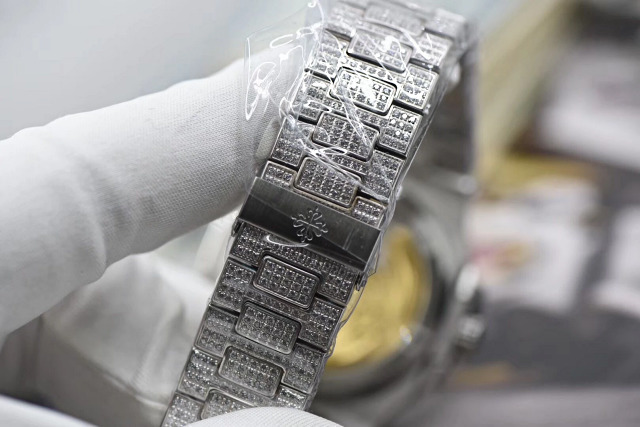 These diamonds embeded on the case, dial and bracelet are precisely cut by machine, each has the same size. Because there are so many diamonds, both watches are sold at a very expensive price. On the diamond dial, except crystal indexes at 6, 9 and 12 o’clock, there are no other hour markers. I do not think this will bring trouble to you to read time. Three markers are enough for me to know the time precisely, if set with too many hour markers, the beauty which full diamonds bring will be broken. 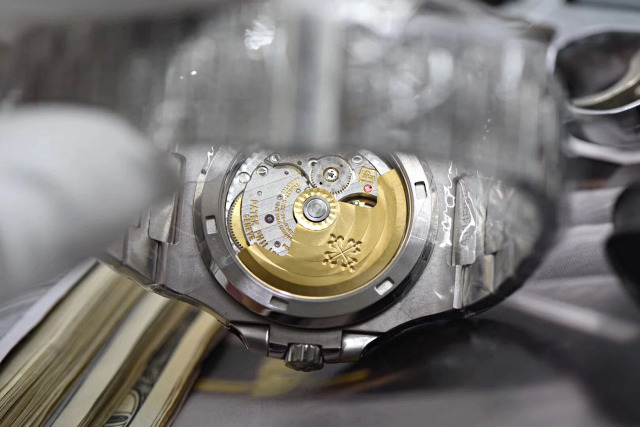 Central hour and minute hands are applied with luminous material. 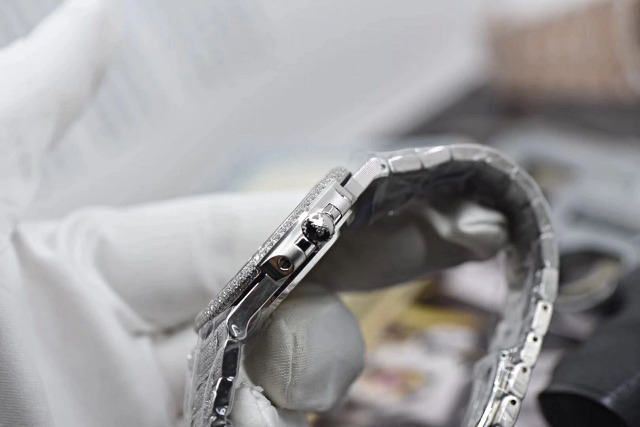 Both watches are equipped with Asia clone Patek 324 movement, which is based on genuine Japanese Miyota 9015. 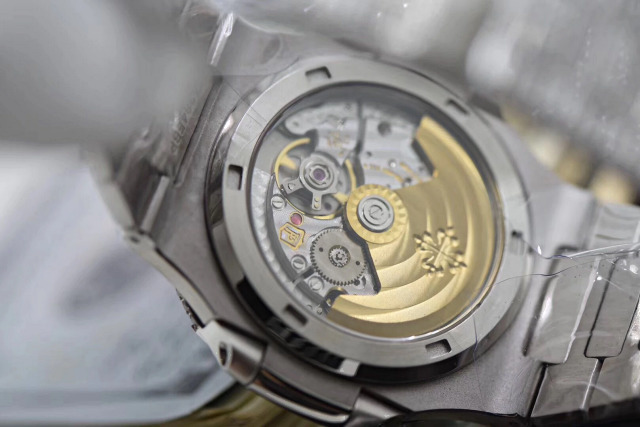 Seeing from the crystal back, the clone 324 movement has a very close outlook to genuine Patek Philippe 324 Caliber. Because of being modified from a Japanese Miyota 9015, the accuracy and stability are much higher than some cheap Chinese Automatic movements. So, a lot of watch factories now would like installing Miyota automatic movement in their replica watches rather than using Chinese movement. 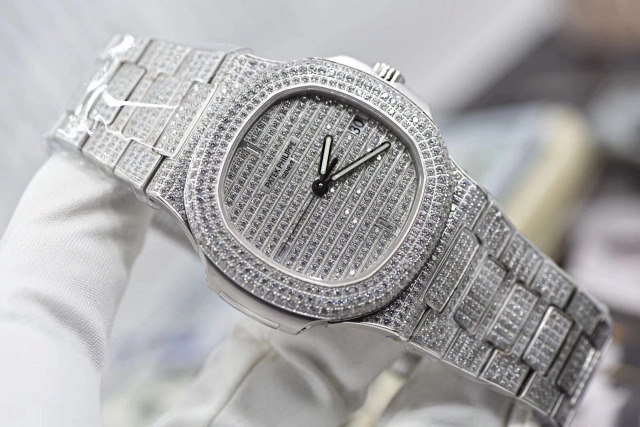 What’s your opinion about these two full diamond Patek 5711 replica watches? Do you like them? 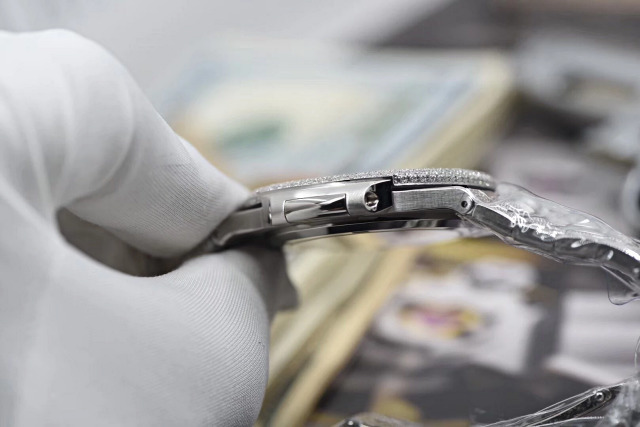 Whatever, the truth is that genuine watches must be sold at more than $1,000,000 US Dollars, while the replica is less than $1000.